Theresa May is on the record as an Islamist. Why do I say this? Bear with me. More specifically, while a prominent member of the British government (nearly the longest Home Sec. ever), that woman claimed repeatedly that Sharia Law has “been of great benefit to women“. Alright, she did not say yet that cutting off heads has been of great benefit to men, so she is coming a bit short of the most demented Islamists, I must admit. “Sharia” is a system of law established by so-called “Islamist scholars“, the little scribes of some of the world’s greatest dictators, more than a century after Muhammad’s death. From all we know from Muhammad’s life, opinions and sentiments, clearly, the Prophet would have disallowed Sharia. Muhammad thought women could dispose of their bodies as they wished, whereas Sharia imposes upon them the death penalty if they do in ways Muhammad obviously tolerated. Long subject. Sharia formalizes violence in the Qur’an… Caliph Uthman’s Qur’an, not Muhammad’s (that one was… boiled, all over the Musllim empire!) And then Sharia goes well beyond anything in the Qur’an. 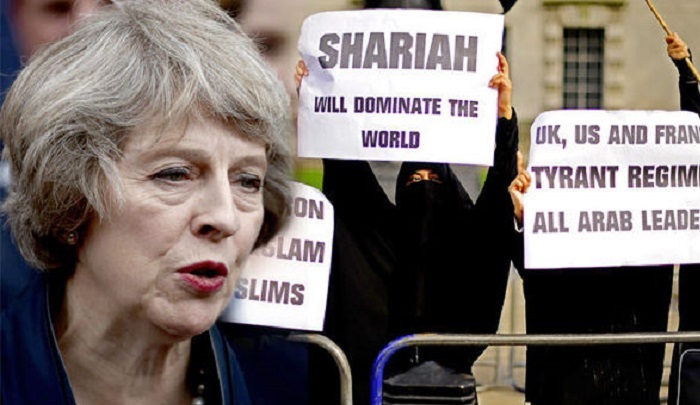 Under May, Theresa, as “Home Secretary“, and now the new Prime Dictator of Britain, around 100 “Sharia courts” have been established around Britain, with her benediction. This much re-iterated Islamist statements of hers, about the “great benefit” of Sharia, caused a few waves. Thus May, the new Prime Dictator of Britain nominated a commission, to see if there was a problem. Who chaired that whitewashing organization? You guessed it. Two Imams. One may as well, may be, put two bishops in charge of seeing if Catholic Inquisition Courts were not of “great benefit to women”. Thus, without any election, Great Britain will have a new Prime Minister Wednesday, Theresa May, the “Home Secretary”. When hard-core Brits are asked how democratic that is, they reply: the head of state is Queen Elizabeth, so nothing changed. Indeed. And Prince Charles, who, like his mother got many millions in European Union subsidies, made more than 20 million pounds of income last year. Prince Charles personally own as much an area of land as two-thirds of Yosemite National Park in the USA (I computed). The Brits say: this is how our democracy works: we debase ourselves, and then think haughty of ourselves, as butlers do, when thinking of their masters. People with brains will say: that’s how plutocracy works. The way Great Britain is operated nowadays is becoming a menace, by example, to democracy everywhere around the planet. Contemplate Malaysia: It has been Islamizing. 50% of the population Is Muslim, and on those 50.2% (official percentage), Sharia law applies, to Theresa May’s delight. Never mind if you were born a “Muslim”, and now you do not believe in that obnoxious, obsolete, fascist, human rights violating superstition of some desert savages. There is now a powerful political movement to impose Sharia on all of Malaysia. Is it inexplicable to want to please the Islamists that much? “Allah knows, and you do not“ (to quote the Qur’an). So does Theresa May. Let’s keep it that way, ever more so. Just a hint: many of the world’s richest plutocrats (such as The Sultan of Brunei) claim to be Islamists (not a coincidence: Islam is dictator-friendly, to the point Hitler got some of his main ideas from it, the Fascist Principle, or Fuehrer Principle). The United Kingdom’s strategy? To become the new Switzerland (while forgetting, or, more exactly, ignoring that Switzerland’s main industry is pharmaceutical and food, of top world class level, namely real industrial production, not just worldwide financial conspiracies of the lowest sort).